It’s riding season again, yay! At CMG we’ve been scoping out which long term testers we think best suits our needs. For myself, I was looking for an adventure touring machine as I plan on doing some road trips this year but would also like something that could double duty as scout for the gravel sections of the Fundy Adventure Rally. Since BMW are the prime sponsor for the rally I approached them first and concluded that the new liquid-cooled R1200GS would fit the bill quite nicely. 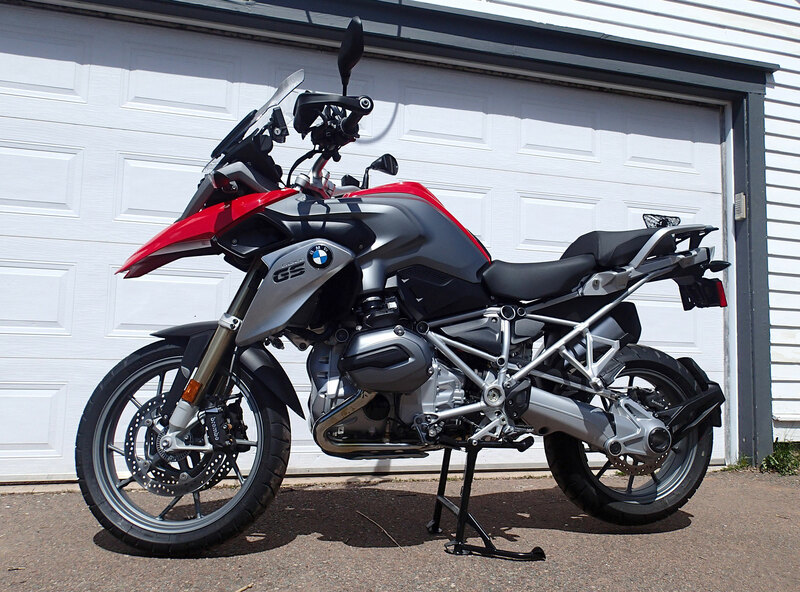 The fifth generation 1200GS (see our launch piece here) has been around for a couple of years now which means that there are a lot of accessories for it – many of which we intend to try out once we’ve put on a few miles to see what it needs. … but alas, also came with cast wheels. liquid cooled heads offer more shin room but also require additional protection for the rads for our planned off-road excursions. If we’re going to get dirty with the big GS then it’s going to need the laced wheels and BMW has indicated that they’ll get a pair shipped out to us as soon as they can. You can get them fitted at time of purchase for an additional $450 (but you don’t get the cast wheels too!) Still the price is right and a much better investment in fun than the $475 Comfort package IMHO. This will be quite handy as it means we’ll have two sets of wheels; one we can shod with knobbies, the other with road tires for quick changeovers pending on the task ahead. Since the GS will be roped into to Fundy Adventure Rally scouting duties we’re also going to have to add some protection (crash bars and skid plate for example) and as it’s now got water-cooled heads, I’ll have to add some protection for the radiators too. At 238 Kg curb weight, it’s not light (the 2013 redesign saw the addition of 9 Kg), so the intent is to keep it to the minimum, as the last thing I want to do is add unnecessary mass when I do finally hit the trails! And yes, I know it’s not a dirt bike, but we intend to take it through progressively tougher terrain to see how it copes. A diversion to the town of Parrsboro meant that i took in some spectacular roads and Fundy shoreline. To date I’ve taken the bike for a quick spin from CMG HQ in Sackville, NB to Michael Uhlarik HQ in Halifax, NS, via some glorious Fundy shoreline twisties. Although it was all paved and mostly four lane, it reminded just how brilliant the GS is on the road. Although the new GS is a significantly different beast from the previous generation it still has a 140 km/h happy spot while cruising. I don’t quite know why, I would just be humming along and glance down at the speedo and it was always at 140 km/h. Of course, even in the Maritimes this is considered a tad too spirited so I’m going to have to set aside a few hundred dollars for inevitable speeding infractions -the alternative of keeping it at 110 just doesn’t cut it. Mr Uhlarik pronounces great wisdom about the new GS. Sadly Editor ‘Arris had his earplugs inserted at the time. On first take, the ergonomics are great – spacious with an upright pose. The new vertical intake and exhaust set up offers more room for the shins (it was tight on the old design for someone lanky like me) and the adjustable seat and wide bars suit me just fine. Oddly I did find the seat a little hard (will investigate options, but I do have an overly sensitive arse) and the screen not quite tall enough. It comes with a very well thought out knob adjuster that can be used on the go, but I did find when I set it to its highest position it wasn’t quite enough to prevent the blast catching the top of my lid and bobbing my head. I’m working on the list of add-ons now and will see what I can get and post the results in the next update. The summer’s looking like a lot of fun, speeding tickets allowing. Parts like these SW-Motech crash bars haven’t gone up much in CAD dollars, as they’re sold in euros. However, the Canadian retailer must keep in mind the effort to limit cross-border shopping by Americans. 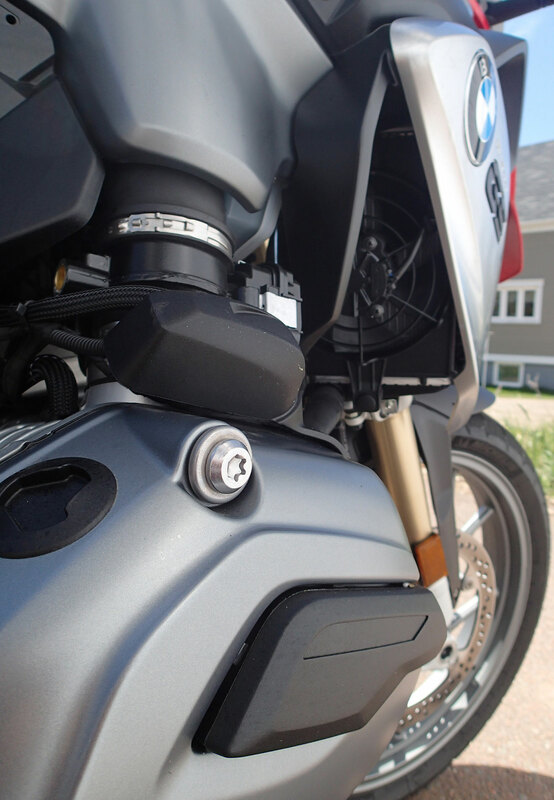 So we’ve got a BMW GS, considered to be one of the most dirt-capable ADV bikes (as much as any 500 lb bike is dirt-capable), with cast rims and street tires. 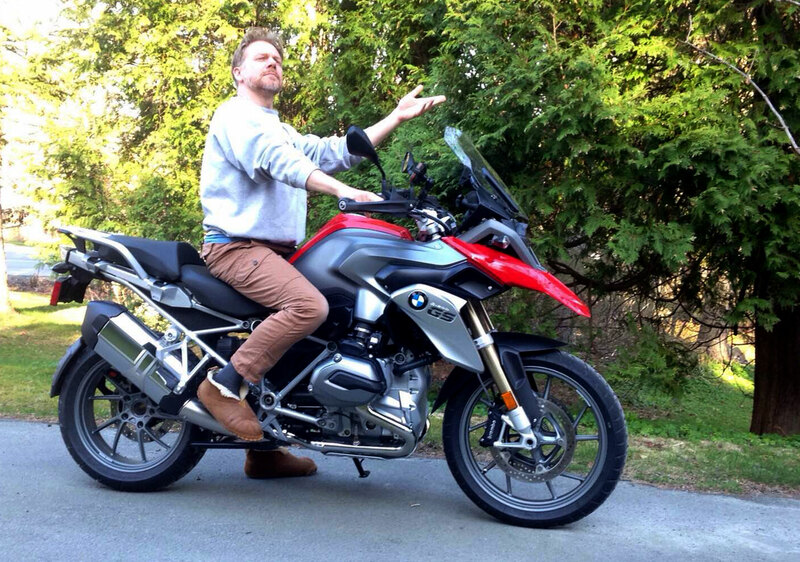 So pretty much completely an ADV poser, with the exception of the 19″ front wheel (just like a new V-Strom, which looks a lot like a BMW GS). 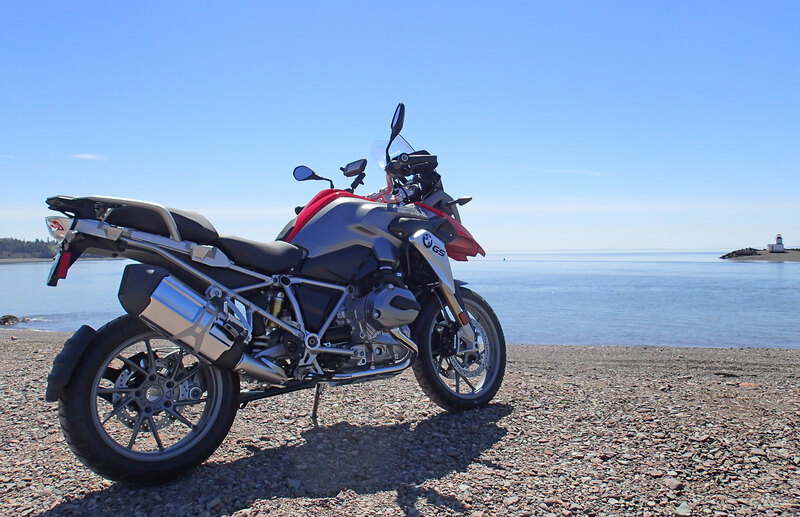 Personally, if I had no off-road plans, I think I’d rather have an R1200RT (or S) for touring/sport-touring. I would add the rear seat delete also.